The rapidly growing city of Beit Shemesh was promised 17,000 new housing units at a ceremony on Monday attended by senior government officials, Arutz Sheva reported. The apartments are slated for Ramat Beit Shemesh D and E, along with commercial space allocated on 130 acres for businesses and hotels. Funds were also pledged for expansion of infrastructure and to improve the local parks and public transportation. “This new plan will double Beit Shemesh’s size. That’s a huge accomplishment,” Prime Minister Netanyahu said at the ceremony on Monday. “I see this city as becoming one of the largest cities in Israel. It’s developing at a very fast rate, and it is home to chareidi, secular, traditional, Ashkenazic and Sephardic Jews, as well as to new immigrants. Acknowledging secular-religious tensions in the city, Netanyahu said: “I’m aware of the problems inherent in the new plan, and so are my ministers; but we will solve these problems by working together. This land, and this city, belongs to all of us; and there is room here for everyone. 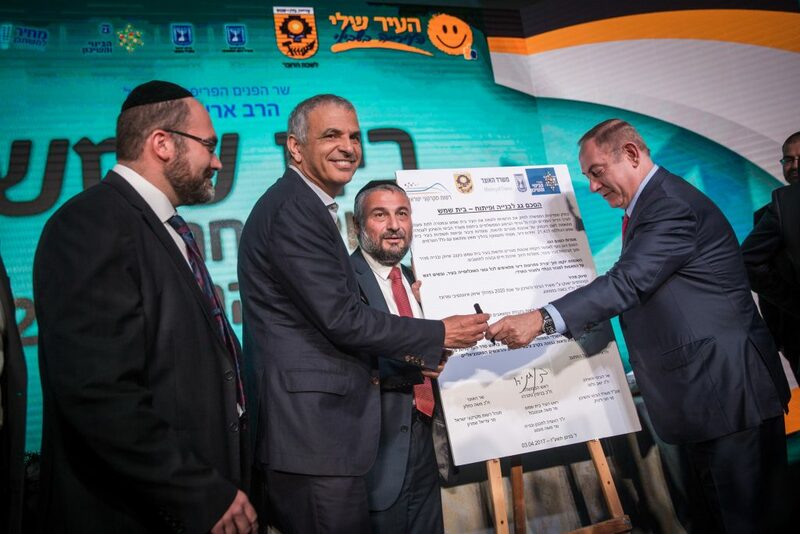 Also attending were Finance Minister Moshe Kahlon (Kulanu), Construction Minister Yoav Gallant (Kulanu), Interior Minister Rabbi Aryeh Deri (Shas), Beit Shemesh Mayor Moshe Abutbul, and Beit Shemesh Construction Head Moshe Montag, as well as several other mayors and public figures. Currently, the population of Beit Shemesh is 104,000, currently Israel’s fifteenth-largest city.